A few years ago a very good friend bought me D.J. Taylor’s biography, Orwell: The Life. It's an entertaining and informative read. However, the book contains several important factual errors. Mr Taylor is a respected academic, critic, essayist and novelist. Mr Taylor regularly writes comment pieces, essays and reviews for the Guardian, Observer, New Statesman and Spectator and is fairly visible on the UK literature festival circuit as a speaker, discussion panel chairman and as a literary award judge. Mr Taylor served on the Man-Booker Prize panel of judges in 2003. I think it is important to address these errors as the biography will likely become a standard reference for future Orwell scholars. And, with so much disinformation, deliberate distortion and innaccurate information regarding key events during the Spanish Civil War [SEE: Burnett Bolloten’s excellent The Grand Camouflage: The Communist Conspiracy in the Spanish Civil War] I think it essential that errors are addressed and corrected. My commentary on the errors is split over five posts and a summary. 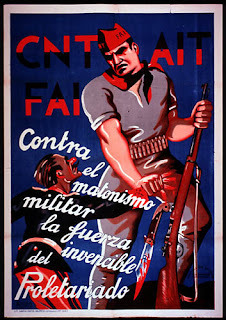 In this post I note the minor errors, in the second post I discuss Stukas over Guernika, in the third post I discuss Catalan, in the fourth post I discuss May Day in Barcelona, 1937 and in the final post I again discuss the May, 1937 street fighting in Barcelona with reference to the Assault Guards. Okay, let's get on with it. Orwell - The Life - All page numbers pertain to the 2003 hardback edition. Homage to Catalonia - All page numbers pertain to the 1982 Penguin edition, and cross-referenced when appropriate with the text as it appears in Orwell in Spain edited by Peter Davison, published by Penguin in 2001. This cross-referencing is important when considering my comments about the Asaltos (Assault Guards), as you'll see. Orwell- The Life appear in italics. Homage to Catalonia appear in standard font. Other works cited appear in a different font. My emphases in the cited passages appear in bold. Okay, let's really get on with it. Evelyn Waugh's elder brother Alec remembered watching Kent play cricket at Blackheath, with a stream of telegraph boys arriving on bicycles to present the players with their summonses to call-up. Alec Waugh may very well have thought he recalled such a sight, but he would have been mistaken. The call-up, or conscription, was not introduced until January 1916, i.e. eighteen months after the war started and the so-called events described. Orwell's poem On a Ruined Farm near His Master's Voice Gramophone Factory is incorrectly titled as On a Ruined Farm near His Majesty's Voice Gramophone Factory. D.J. Taylor describes Las Ramblas in Barcelona as being: Barcelona's principal thoroughfare. The Ramblas (Las Ramblas is actually five connected ramblas) do not, have never, and will never, constitute Barcelona's principal thoroughfare Most illustrious, most celebrated, the best known, yes; but principal thoroughfare? No and never. Why is this important? Well, during the May Day events of 1937, as described by Orwell in HTC, Orwell was positioned on the Ramblas. To read D.J. Taylor's description of the Ramblas as being the principal thoroughfare could lead readers to think that Orwell was therefore part of force attempting to control movements on what was considered a strategic highway. Not so, the Ramblas formed the boundary line between the Administration and the Raval (or Barrio Chino as it was then popularly called), the working-class, and predominantly anarchist barrio. After the successful insinuation of Communists into the local administration the Ramblas became a front line between political power and proletarian order. It's as well to know that Barcelona was once a gated city and the part of the city containing the cathedral, various palaces and what is now the Generalitat (regional autonomous government H.Q.) and the Ajuntament (City Hall) formed the inner city, entry to which was strictly controlled. Then they caught the early train at Barbastro and transferred to an express at Lerica. I think this is a straightforward typo. The town is Lérida in castellano or Lleida in catalan. SEE HTC, page 105: ... caught the five o'clock train at Barbastro, and - having the luck to connect with a fast train at Lerida [accent missing] - were in Barcelona by three o'clock in the afternoon of the 26th. Here Taylor refers to the Soviet Union inspired militarisation of the Republic's armed forces: ... into which all the armed forces had since February been theoretically incorporated. Both D.J. Taylor and Orwell are mistaken. Theoretically the armed forces had been incorporated into the Popular Army since the passing of a decree on October 9th, 1936. [Both Taylor and Orwell are referring to February, 1937] Which makes the POUM's, and other militias', resistance to militarisation even the more remarkable. The road to militarisation began with an appeal by Largo Caballero (for a time referred to as the Spanish Lenin until he fell out of favour with the Communists) in September, 1936. Ethel Mannin was a very well known, well published, and according to many, well regarded author and activist in her own right. I've read several of her novels and travel books. She did a lot of work to aid the Anarchist cause in Spain. To be simply labelled the wife of a Trotskyist activist I find a bit strange ... I wonder why?